By Judita Bačiulytė and Kazimieras Mizgiris. The history of the treasures of Juodkrantė begins in the middle of the 19th century, when a large quantity of raw amber was discovered near Juodkrantė during a project to deepen a seaway in the Curonian Lagoon, which is known as Kuršių marios in Lithuanian. 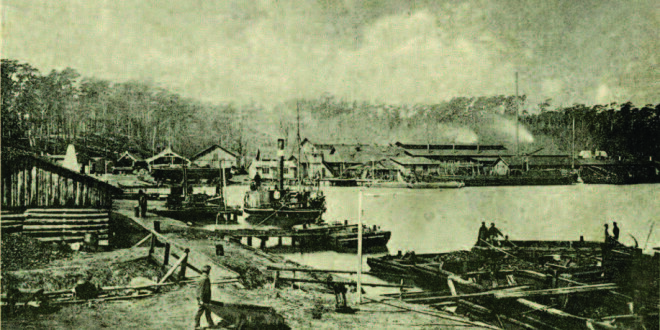 In 1857, two famous merchants from Klaipėda, Wilhelm Stantien and Moritz Becker, started the firm Stantien und Becker and began to dig up the bed of the Lagoon near the small fishing village of Juodkrantė. 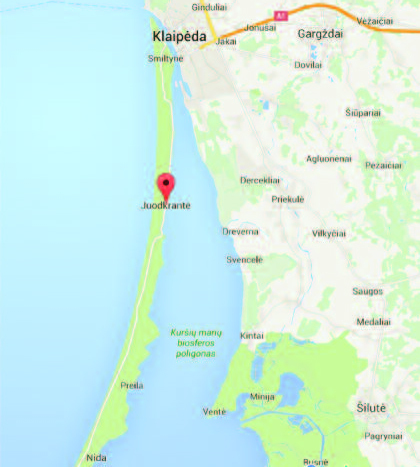 Location of Juodkrantė on the Curonian spit. “A merchant from Klaipėda had been sailing for many years in the nearby seas in a boat similar to a sailboat, which had a covered deck and cabins at both ends. The merchant made a living by buying up vegetables from seaside inhabitants and then selling the vegetables to the residents of Klaipėda. Once, as he was sailing to Klaipėda with a full load of vegetables, a fierce storm arose. He was unable to continue the journey. He dropped anchor near Draverna, at the edge of the Curonian Lagoon. After the storm had passed, he weighed anchor, and when he examined the dirt that had been pulled up with the anchor, in the caked-on mud he noticed a large piece of yellow amber, the size of a goose egg. This event, it is said, made him give up the business of selling vegetables and take up the business of mining amber instead. “One day a group of hired hands sailed to the same spot in the same boat and started preparing to mine for amber. They dropped anchors at both ends of the boat. 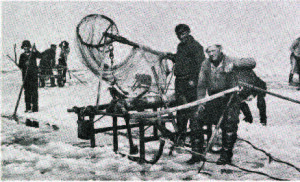 They tied one end of a rope to the handle and metal hoop of a meshed scoop, and they tied the other end to a winch mounted on the deck of the boat. They bowed to the Almighty and began to dig. Fishermen who regularly fished the Curonian Lagoon gathered nearby and had a good laugh at this undertaking. But once they witnessed the miners’ success, they asked to be hired to help. For a time the merchant collected amber from all parts of the Curonian Lagoon, but one day the Prussian government intervened and prohibited his enterprise. But the merchant was clever. He began to look for a way to reach an agreement with the government. And he succeeded. According to the contract, the merchant was required to dig a watercourse for ships to sail through the Curonian Lagoon, and he was to deposit the soil he dug up on shore. In this way a watercourse was dug of about 30 kilometers in length, from the Nagliai peninsula to Klaipėda. The soil which had been dug up was deposited in the hard-toreach bays of the Curonian Lagoon, near the sand dunes of Neringa. It soon became clear that, together with raw amber, pieces of amber that had been worked on by human hands were being recovered. For a long time no one understood the archeological and scientific significance of these discoveries. At first workers would sell these prehistoric articles, or they would simply give them to visitors to Juodkrantė as gifts. Commerce in scientifically valuable articles of amber was prohibited only three years after mining for amber in Juodkrantė had begun. This happened when Richard Klebs, an expert geologist, came to work at the Stantien und Becker firm. Any worker caught stealing amber was punished severely. It took several decades (1860–1881) to collect the treasures of Juodkrantė. This was the largest collection of amber in the world. 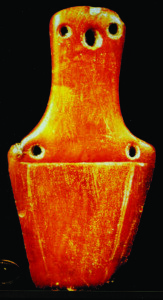 It consisted of raw amber and unique amber articles from the Neolithic and Early Bronze ages. Scholars from around the world took an interest in this collection. The main location for the discovery of the treasures of Juodkrantė was a shallow spot in the Lagoon, 650 meters north of Juodkrantė. The shallow stretched for about 2.5 kilometers. Old amber articles and pieces of raw amber were discovered at a depth of 2 to 4 meters. It is not clear exactly how many amber articles were found by mining amber near Juodkrantė, nor under what circumstances. The literature generally estimates the number to be between 400 and 500 items. R. Klebs described the artefacts that were found in his book, Amber Ornaments from the Stone Age (1882). The charts that R. Klebs published in his book list 205 amber articles, while his text describes 435 articles. Most of the described articles have not survived. This book is therefore the only source for the study of the Juodkrantė collection and the study of Neolithic amber articles found in other areas around the Curonian Spit. The Juodkrantė collection contains amber figurines of humans and animals. 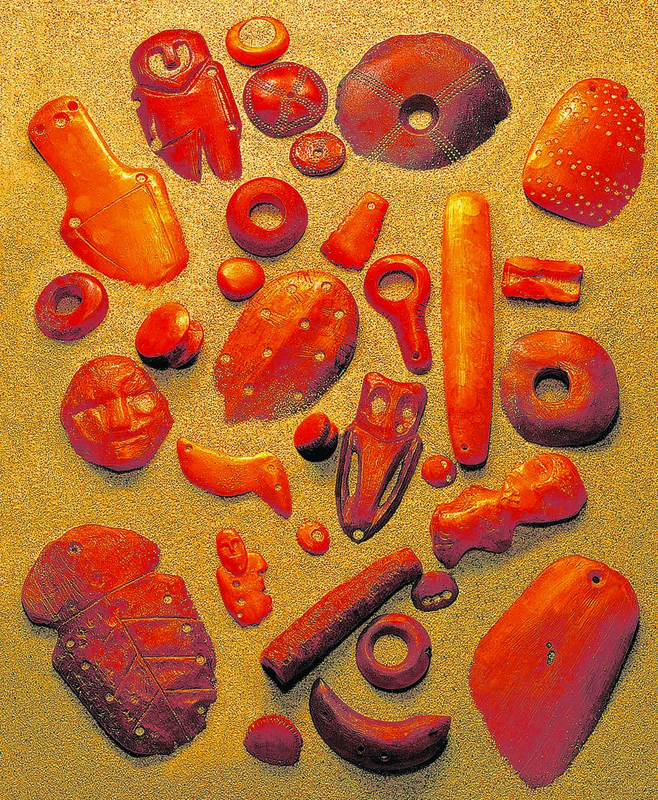 These are especially important Neolithic examples of the plastic arts. The figurines have various shapes and are individually sculpted. They may be the oldest examples of the plastic arts in Lithuania. One of them apparently depicts a woman; another depicts only a human face. 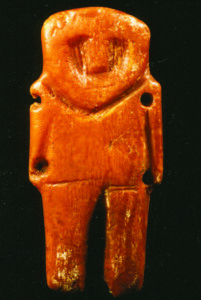 These figurines were apparently worn as amulets: some of them have small holes drilled into them. The treasures of Juodkrantė also include a figurine of the head of a very schematized animal, most likely a horse. Cylindrical beads, buttons, discs and pendants in the form of stone axes make up the majority of the items found. Amber buttons in the form of small lenses, which the inhabitants of the Curonian Spit wore 4,000 years ago, have little holes in them for threading. The holes have the shape of the letter “V.” These holes, which were drilled with primitive drills made of flint, like those drilled into pendants and figurines, are characteristic of Neolithic times and the Early Bronze Age. These drills were short and had a tip which was somewhat sharp. That is why the holes were drilled from both sides, which gives them the appearance of two cones, the tips of which come together. The treasures of Juodkrantė are remarkable in that they include articles from various time periods and various cultures. Researchers speculate on how this could have happened. Dr. Rimutė Rimantienė, a historian, considers one possibility: “Perhaps there was a shrine by the Curonian Lagoon, which was important for the entire spit. Sacrificial pits are known to have survived at a single location for centuries. In addition, during the Stone Age sacrificial offerings were often drowned in the sea. The custom of burning sacrifices started only when agriculture established itself.” Audronė Bliujienė offers more versions in her book Prehistorical Lithuanian Amber. One version is that most of the amber articles found near Juodkrantė may have been votive sacrifices deliberately sunk into the sea. Her book gives another version. Some people think that some of the articles found near Juodkrantė may have flowed through seaways from Stone Age settlements of various cultural levels, and in this way they may have come to be deposited in the Lagoon. It may also be the case that the Neolithic settlements themselves were washed away due to changes in the shape of the Littorina Sea (the precursor to the Baltic Sea). Treasures of Juodkrantė (in recreated form). Wood was also found while mining for amber. According to Richard Klebs, this is wood which had been in the water for a long time. Pieces of coal were also found. The wood and the coal may be evidence that the Neolithic articles were deposited by streams from settlements near the seashore. There are three known Neolithic settlements in the Juodkrantė region. Geological studies show that there were currents in the area of the Curonian Spit, and amber may have been transported along these currents. The Amber Bay may be the place where Neolithic settlements had been located. However, exactly how amber articles ended up in the Curonian Lagoon remains a prehistorical riddle which scholars are still trying to solve. Up until the Second World War most of the articles found near Juodkrantė were housed in the Geology and Paleontology Section of the Museum of Albert University in Königsberg. This museum was also known as the Amber Museum. It was the largest amber museum in Europe before the Second World War. Most of this collection was destroyed by fire on April 8, 1945, during the bombing of Kˆnigsberg. Earlier, at the end of 1944, a few amber items, including some of the articles found near Juodkrantė, had been packed into boxes and transported by horse-drawn carriage to Göttingen University in Germany. Professor Karl Andree, who had studied at this university before the war, organized this transport. According to the German journal Stern, 10,000 of the most valuable exhibits from the museum were loaded into two boxes. This was a tenth of the entire collection and included 22 exhibits from the treasures of Juodkrantė collection. As the war front approached, the boxes, along with other valuable art works from the museum, were hidden in salt mines where they remained until the end of the war. When the English army took over Göttingen, the boxes were removed from the mines. In this way they were saved, because later the mines were flooded. The boxes were transported from the mines to a small town in Lower Saxony. The collection, along with other valuable exhibits, was returned to Göttingen in 1958. Amber amulet with drilled holes. It remained in the basements of the university for a long time. Later, when the collection was thought to have vanished without a trace, Sven Schuette, a student, stumbled upon it unexpectedly as he was examining boxes in the basement of the university for his course work. In 1976, the German journal Stern published a long article about this unique collection of hand-crafted amber articles from the Stone Age. After this article was published, the student came into disfavor with the governing body of the university. One can only speculate why this occurred. 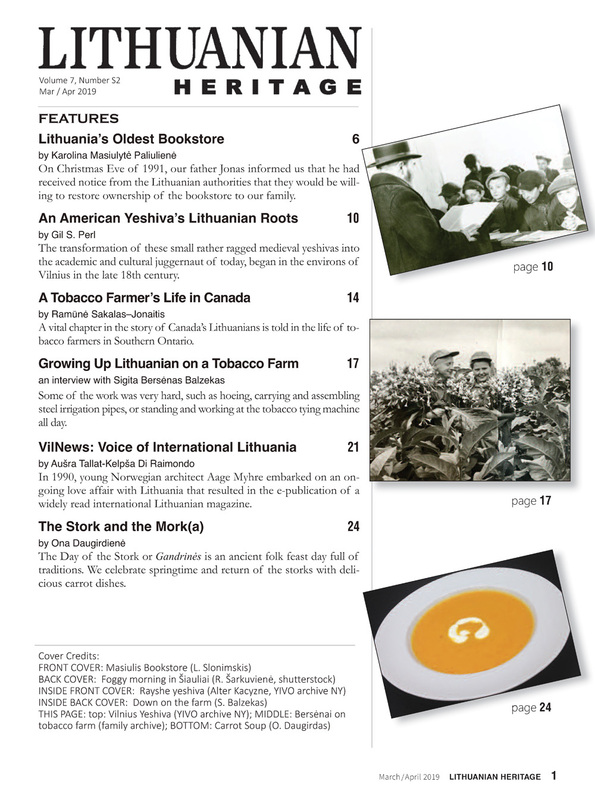 An article by Butautas Barauskas details the student’s discovery. The article was entitled “Aiškėja dešimtmečius saugoto ‘Juodkrantės lobio’ paslaptis” (“The Mystery of the Treasures of Juodkrantė, Safeguarded for Decades, Is Becoming Clear”). 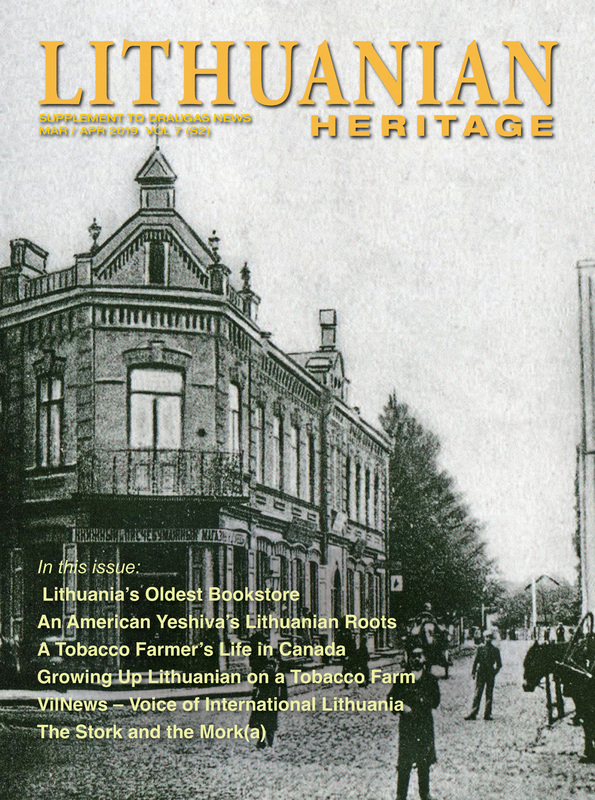 It was published in the Lithuanian journal Gimtasis kraštas in 1995. When it became clear that part of the treasures of Juodkrantė was in Germany and that some of the articles were being displayed in exhibitions, Virginija and Kazimieras Mizgiris, owners of the Amber Museum and Gallery in Nida and Vilnius, got the idea of recreating the entire collection of lost treasures in order to rescue this cultural asset from oblivion and make it available to everyone. Virginija and Kazimieras Mizgiris relate that at first they contacted an acquaintance, Dr. Wolfgang Weitschat, who lives in Germany. He is a scholar and an associate professor in the Geology and Paleontology Institute and Museum at Hamburg University. Virginija and Kazimieras Mizgiris wanted to make accurate copies of the remaining original articles, and they hoped to include a few original articles from Germany at the opening of an exhibition of the recreated “Treasures of Juodkrantė” collection in Nida. However, they were unsuccessful. According to the article by Butautas Barauskas, at first, the rector of Göttingen University graciously allowed Dr. Weitschat to study amber amulets and advised him to contact the custodians of the exhibits. However, it later became clear that those responsible for the preservation of the exhibits were not interested in helping. 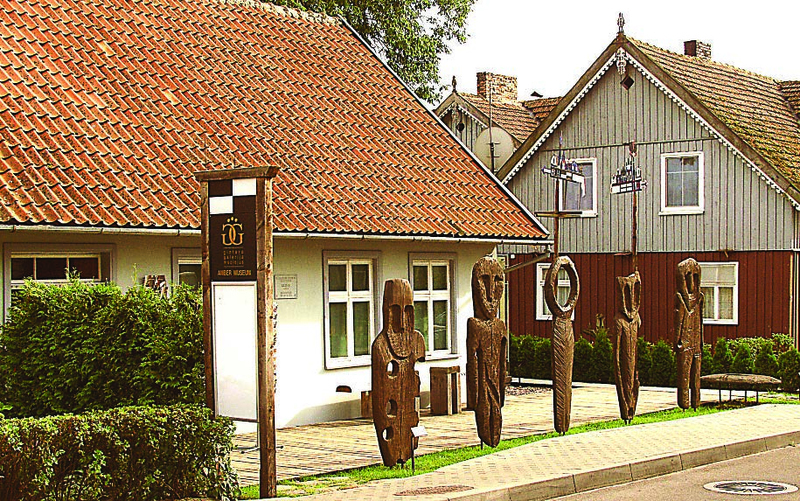 Amber museum in Nida, with wooden figurines patterned after amber amulets. Despite these setbacks, the treasures of Juodkrantė were “returned” to the Curonian Spit in 1994, thanks to the efforts of Virginija and Kazimieras Mizgiris, dedicated proponents of amber in Lithuania. The amber articles, which had been found in the Curonian Lagoon near Juodkrantė in the 19th century and which had disappeared in the chaos of the Second World War, were recreated and so were rescued from oblivion. Bronė Kunkulienė did the restoration work. She is an artist and professional restorer who works at the Pranas Gudynas Art Restoration Center. She used 20 kilograms of yellow amber to recreate this collection. She used tools made from flint, and she followed the authentic drawings found in the book by Richard Klebs mentioned above. She compared these drawings with analogous items from the Stone Age discovered along the coast of Lithuania. The recreated collection of the treasures of Juodkrantė is now available for viewing at the amber museums run by the Virginija and Kazimieras Mizgiris in Nida and Vilnius and at the Palanga Amber Museum as well. Of course, there is the possibility that if extraction of amber from Juodkrantė is renewed (as has been discussed recently in Lithuania), perhaps new objects from the Stone Age will be found. Such objects, left undisturbed during the mining done in the 19th century, might comprise a new and equally valuable collection of historical artefacts. Next An Interview with Stanley Balzekas, Jr.